If you’re just jumping into this series, we walk you through the process of getting an example folder set up with all of the files that we’ve been building up through the previous videos. If you’ve been following along, there’s just a couple bits in here you’ll need to make sure you’ve got everything set up for the next videos. Okay. I'm going back to the file explorer here. 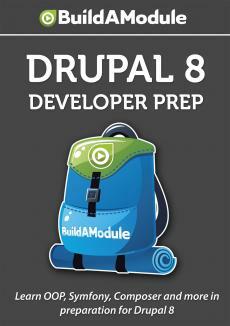 Now, here's our folder where we just put our Drupal 8 Alpha 12 version. Now, what we're going to do here just like we have in previous videos is we're going to use this folder because it has the whole AMP stack set up for it already. We're going to use it to run our examples. We have a couple of examples at the outset here that are not Drupal specific. They're to get us familiar with the YAML syntax, and then from there we'll be working with modules directly in Drupal 8. So, I'm going to open up this folder, and then let's jump to our resource pack directory and it should look something like this. We have the Symfony and d8 and upgrading modules folder which contains all of the examples that we'll use for the remainder of this series. If we expand this, we'll see our steps folder here, and our first step is this folder called "Initial State. " Now, this is the state of the Symfony framework that we were building in previous videos saved from the last edit that we made. The way that we ran these samples is we created an examples folder inside of our Drupal directory. So, let's start by doing that. I'm going to create a new folder and call it "Examples," and now let's copy over this first folder and I'll open up the examples folder over here and paste it in. And while before in previous videos this folder would be called "Symfony," we're going to call this one "Symfony 2" just to differentiate it from the previous examples.